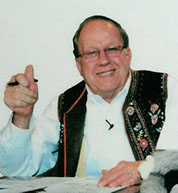 Portfolio Categories: 1990 and T.
Jolly Joe Timmer of of Bethlehem, Pennsylvania, has a radio show, television show, polka band, music store and picnic grove all strongly promoting polka music. When asked when and how he became involved in polka music Joe said, “My time started after high school, 1948. Before he had a band, he used to go dancing every Saturday night at the Lincoln Hall in Miller Heights, Pennsylvania. He danced every polka, waltz and oberek. Prior to that, when he was a little boy, his mother took him to clubs that had polka music. He liked the music and started playing. The Jolly Joe Timmer Orchestra has seven albums to its credit. Jolly Joe’s House of Music is located in Bethlehem, Pennsylvania. The store is stocked with numerous items dealing with polka music and also carries a large selection of records and tapes from artists across the country. He began events at Timmer’s Grove located in Point Phillips, Pennsylvania, in 1970. The grove features polka music by some of the country’s best bands on a regular basis. They serve home cooked foods and the grove is heated for the winter months and has picnic tables out for summer picnics. Another area Joe is active in polka promotion is his record company. Rave Record Company has recorded many bands and many styles of polka music including Polish, German and Austrian styles.